From the moment a child begins to crawl the explorer within is brought to life ready for the many adventures ahead. At an early age these adventures will often involve satisfying their curiosities of all the interesting things around them and discovering how to do things and how different things work. As safety is not always on the mind of a fearless adventurer, it can be very easy for a child to get into a dangerous or even a life threatening situation. You do all you can to babyproof your home, however, there often lies a forgotten risk – an easily opened or ajar window. A small yet very effective and extremely affordable solution is the MAX6 window restrictor. The window restrictor limits the opening of a window to no more than 100mm – enough to enable air to circulate throughout your home, but not enough for your child to fit through. The opening width can be decreased if necessary during installation by positioning the fixing points further apart from each other. This lockable window restrictor can be fitted to any profile and style of window, and even doors – including aluminium, wood, metal and uPVC profiles. It is extremely easy to install yourself, and comes with all the parts necessary to do so, including self-drilling screws. 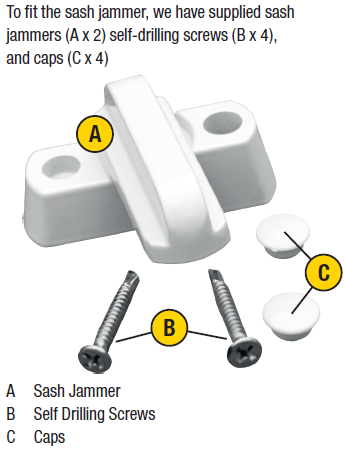 Another essential product is the MAX6 Window Lock (Sash Jammer or Sash Window Restrictor). It is essential to remember that your home can easily be a target of a burglar and taking even the smallest steps to making their entry into your home more difficult can essentially slow them down enough to give up. A very common burglary method with uPVC windows is to lever the door or sash leaf of the window, which creates a gap and allows access to locks etc. The MAX6 Window Lock is placed to prevent the levering of the door or sash leaf of the window, thus blocking the movement and therefore entry from the outside. 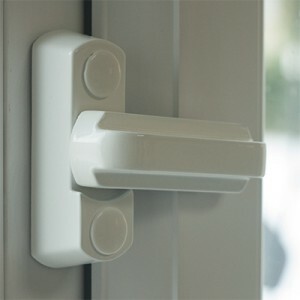 With a simple turn of the window lock arm, you are protected! 1. You will first need to decide where on your window you want to put the restrictor. We suggest that you fit the window restrictor in the middle of the longest side opposite the hinges. 2. Take the locking system (C) and remove the plastic cap. To remove the cap, hold both sides of the plastic cap, and press down on where the key goes in (C1). This will make the locking system pop out. 3. Place the locking system on the window frame (1A) (it does not matter if the key hole is at the top or bottom). Mark the 2 screw holes on the window frame using a pencil. 4. Using a drill or screwdriver, screw two self-drilling screws (A) into the locking system to secure it to the window. 5. Take the steel cable (B) and place the knuckle end (shaped like a T) into the locking system already fixed to the window. Place the other end on the fixed window panel (2B) (making sure that the cable is not tight and has length for the window to open around 10cm – see diagrams 1 and 2), and pull the plastic cap away from the end of the cable (a bit of plastic preventing the cap from locking will fall out, throw this in the bin). 6. Mark the 2 screw holes on the end of the cable using a pencil. 7. Using a drill or screwdriver, screw two self-drilling screws (A) into the end of the cable to secure it to the panel. 8. Once both parts are secure to the window, check to make sure the cable fits into the locking system. Take the key (D), place it into the locking system and make sure it locks and releases the cable. 9. Lock the cable into the locking system and open the window. This should allow the window to open approximately 10cm. 10. If everything works correctly, remove the cable from the locking system and attach the plastic cap by pressing it securely onto the locking system. On the end of the cable, attach the plastic cap. At all times is it recommended that you keep the window restrictor locked to prevent children accidentally opening the window and falling out. The restrictor is designed so that it allows ventilation into a room without having the window fully wide open, which can be very dangerous. If you do require the window to open fully wide, use the key to unlock the restrictor, and remove the knuckle from the locking system. This will allow the window to operate normally. Remember to lock the restrictor afterwards, by placing the knuckle back into the locking system and locking it with the key. From the moment a child begins to crawl the explorer within is brought to life ready for the many adventures ahead. At an early age these adventures will often involve satisfying their curiosities of all the interesting things around them and discovering how to do things and how different things work. As safety is not always on the mind of a fearless adventurer, it can be very easy for a child to get into a dangerous or even a life threatening situation. You do all you can to babyproof your home, however, there often lies a forgotten risk – an easily opened or ajar window. 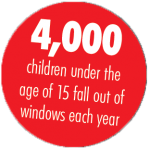 The Royal Society for the Prevention of Accidents (ROSPA) reports that, each year in the UK, 4,000 children under the age of 15 are injured through falling from windows, 2,000 of these children being aged between 0-5 years old. 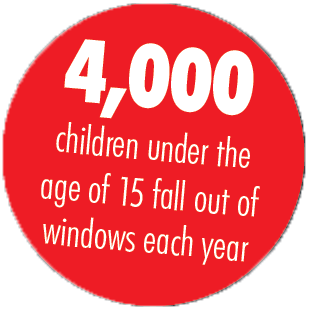 It is impossible to watch a child every second of the day and, even if you do keep a close eye on them when they are near windows, you cannot guarantee that family members, friends or babysitters will do the same. It is imperative that anyone who looks after your children is made aware of how easy it is for children to be hurt or even killed from falling out of a window. Luckily, there is a very simple, affordable and effective solution to this problem – the MAX6MUM SECURITY lockable window restrictor. The window restrictor limits the opening of a window to no more than 100mm – enough to enable air to circulate throughout your home, but not enough for your child to fit through. The opening width can be decreased if necessary during installation by positioning the fixing points further apart from each other. The MAX6MUM SECURITY lockable window restrictor can be fitted to any profile and style of window, and even doors – including aluminium, wood, metal and uPVC profiles. It is extremely easy to install yourself, and comes with all the parts necessary to do so, including self-drilling screws. A step-by-step guide of how to fit the window restrictor is also provided, meaning you can easily fit the restrictor in just a couple of minutes. The window restrictor cable is locked into place with a key so that, should it be required, the window or door can be fully opened. This is simply done with a half-turn of the key. As the restrictor can be unlocked, it can also be used on fire escape windows, providing that the key is kept within easy reach of the window. Some window restrictors in the industry claim that the cable can withstand forces over 500kg. However, despite this, do not be fooled into thinking that this will help keep your child safe. Although the cable can take great weights, it does not mean anything as it is the strength of the locking system which the cable locks into which stops the window from opening. The MAX6MUM SECURITY lockable window restrictor can withstand over 100kg of force once the cable is locked into the locking system, making it one of the strongest window restrictors available (the industry standard is around 50kg of force). This means that you can relax in the knowledge that, even if your child gets themself into a situation where they could fall out of a window, the window restrictor will keep your child safely inside the home. 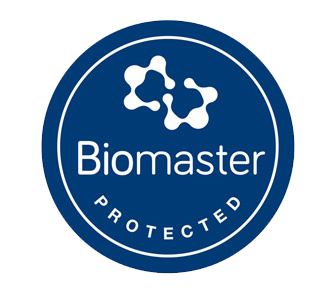 Another unique feature of the MAX6MUM SECURITY window restrictor is that the plastic used on both the cable and locking system use Biomaster, making it MRSA resistant. A special Biomaster chemical has been added to the plastic, which kills the MRSA virus when touched. The window restrictor therefore not only stops your children from falling out of a window, but also helps prevent your child – and yourself – from catching the MRSA virus. In addition to being a child window safety device, the MAX6MUM SECURITY lockable window restrictor also prevents burglars from using the window as an access point to the home, especially if the window is on the ground floor. As the restrictor cable is made from hardened steel, it is extremely difficult to cut. This means that, during the summer, you can leave your bottom windows open to let fresh air in, and feel secure knowing that someone is not going to easily open the window and break into your home. 1. First you will need to see if your window opens inwards or outwards. If the window opens inwards, the sash jammer (A) is to be fitted to the fixed window frame. 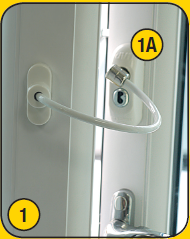 If the window restrictor opens outwards, it is to be fitted to the window on the same panel as the window handle.2. You will need to decide how high on the window you want the sash jammer. We recommend that you have it around half way up the panel. 3. Take the sash jammer and place it on the window (either on the fixed panel, or the frame itself (see step 1). Mark the 2 screw holes on the window frame using a pencil. 4. A removable cap has been provided on the end of the sash jammer. Turn the securing arm of the sash jammer 90 degrees, so it is in a locking position on the window. If the end of the sash jammer is a tight fit against the window frame, then you will need to remove the cap by pulling it off. If there is a small gap, then leave the cap on the end. 5. Remove the sash jammer from the window, and using a drill, make pilot holes where you have marked on the window. 6. Place the sash jammer back onto the window panel, and using a drill and 3mm drill bit, screw 2 x self-drilling screws (B) into the sash jammer to secure it. 7. Take 2 of the caps (C) and press them down over the 2 holes on the sash jammer. 8. Check to make sure the sash jammer operates correctly. To do this, turn the securing arm of the sash jammer 90 degrees (left or right depending which side of the window the handle is on), so it is in a locking position on the window. Then try to open your window. If you cannot open your window, the sash jammer is operating correctly. 9. Repeat steps 1-7 with the other sash jammer. To use the sash jammer, simply turn the securing arm 90 degrees (either left or right depending which side the handles are on). This will lock the window, preventing it from opening. If you want to open your window, turn the securing arm 90 degrees and this will allow you to open the window. We advise you keep the sash jammer locked at all times when no one is present in the room, to prevent anyone being able to lever the sash or door leaf and gain unauthorised entry. A simple installation of a MAX6Window Lock (Sash Jammer) can make a major difference in the way your home is protected from intruders and burglars! It is essential to remember that your home can easily be a target of a burglar and taking even the smallest steps to making their entry into your home more difficult can essentially slow them down enough to give up. A very common burglary method with uPVC windows is to lever the door or sash leaf of the window, which creates a gap and allows access to locks etc. 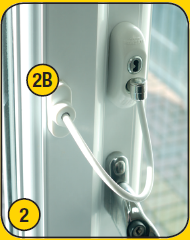 Each pack comes with 2 MAX6MUM SECURITY Sash Jammers and can be fitted either to a uPVC door or uPVC window. Though generally you can use each on a separate opening of your home, you can choose to fix both to a single door or window for added security. They are very simple to install and come with step by step instructions. They are very effective and inexpensive, and are designed to blend in with the hardware of your door or window.